↑ "The Prince Couple is expecting a child". สืบค้นเมื่อ 15 October 2015. ↑ "Announcement from the Marshal of the Realm". สืบค้นเมื่อ 19 April 2016. ↑ "Prince Carl Philip and Princess Sofia have had a son". สืบค้นเมื่อ 19 April 2016. ↑ "Baby boy for Princess Sofia of Sweden". Stockholm: Yahoo! News. AFP. 19 April 2016. สืบค้นเมื่อ 19 April 2016. 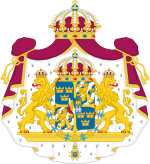 ↑ 5.0 5.1 "Swedish Princess Sofia gives birth to first child". The Local. 19 April 2016. สืบค้นเมื่อ 19 April 2016.